Back row, Moses McMurray, Calli Harding, Andrew Kozlowski, Sienna Sarkess. Front row, Jack Pachla, Carson Hinkle, Anna Girard. Seven Huth Road Elementary students performed at Kleinhan’s Music Hall as part of the Erie County Music Educators Association’s (ECMEA) Elementary All County festival. These students represented Huth Road Elementary in the band, orchestra, and blue chorus. 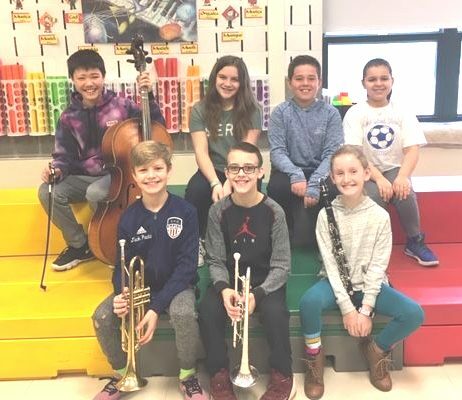 The experience included three rehearsals with the top elementary musicians in grades 4-6 from Erie County school districts and culminated with a final performance for friends and family. A former teacher at Huth Road Elementary School, Kathy Brown, recently published a children’s picture book through Amazon entitled; "Where’s Hurley? ", featuring the therapy dog she brought to school with her for over 6 years, as part of the SPCA’s Paws For Love Organization. The photographs in the book are set at Huth Road Elementary School. This beautiful picture book has already sold over 180 copies. The proceeds from the book are being split between the Erie County SPCA and the Huth Road Playground Fund. 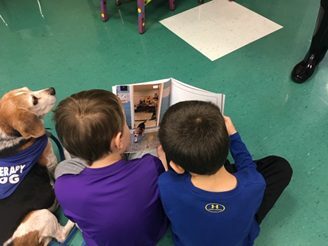 Mrs. Brown continues to bring her dog, Hurley to Huth Road Elementary School for monthly visits to classes that sign up. Although Mrs. Brown retired last June, Hurley continues to work and participate in many Paws For Love events.